Apple are having their annual Worldwide Developers Conference today and I fully expect a healthy Steve Jobs will be presenting in his own inimitable style. Although no-one knows for sure it is customary for Apple to announce their latest improvements to their OSX “Leopard” operating system, any upcoming technical changes to their desktop computers, laptops, iPhone and iPod. 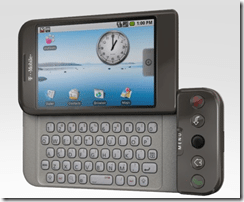 Look what I found on the T-Mobile website earlier: A Google Android G1 emulator. The emulator isn’t fully functional, but looks like it is a very close approximation of the Google G1 end user experience. The built-in Google services for search, mapping and basic email and contact management looks good but it leaves me confused as there are quite a lot of “missing” features conspicuous by their absence.